All spring I have had the idea of an image in my head. An image of very simple composition, that is the younger sibling of an image I took earlier this winter. The winter image was taken after one of our many snowfalls this winter. It is an image of two contrasting texture patterns juxtaposed at the bottom horizontal third. The top texture is of a barren woods splattered with a thick wet snow. The bottom texture is of a hayfield covered by about 4 inches of snow with the golden stalks of un-mown alfalfa sticking up through the snow. It is one of my favorite images I have ever taken. I decided it should have a mate, an image of similar composition but of completely different season - juxtaposing images of images that juxtapose. 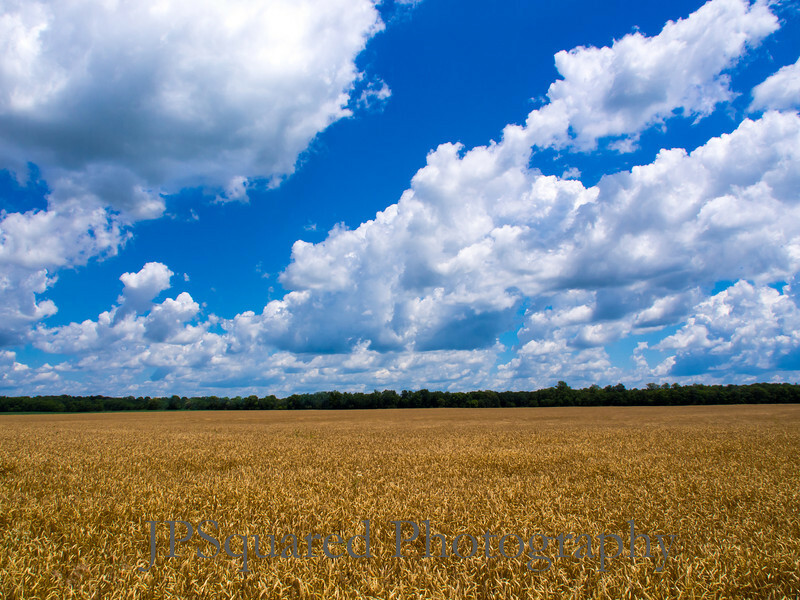 The second Image would be of a golden ripe field of wheat, with a line of trees in the background and blue skies above the trees. SO I have spent this spring scouting for such a field. Only about a tenth of the land where I live is planted in wheat in a given year. Wheat is the fifth planting in a crop cycle that not all farmers observe, it is meant as a rest stop for the soil in the cycle of beans to corn. Only a few of the fields around me had wheat planted last fall. Add to that the need for a clean full line of trees behind the field of wheat and you'll begin to understand the challenge of finding the perfect spot. My wife also understands the challenge, since she had to ride around with me as I took every conceivable detour on our way to run mundane errands. Eventually I found the spot. Then I had to wait for the wheat to grow and ripen. Given the timing of our vacation this year, I thought for sure that when I came back all the wheat would be harvested. But a cool wet spring extended corn planting season, which extended bean planting season, which extended hay cutting season. The wheat was still there when we came back. Since I have been back it has been raining. A LOT. The jet stream is parked right on top of us shooting low pressure system after low pressure system over us meaning we get the hot rain at the front of the system and the cold rain at the back of it. Usually this sort of silliness is meant for Minnesota or Wisconsin, not us. Finally last Friday there was a gap in the weather and we had some sunshine so I headed to the spot and shot the image about 10 different ways. Different placement of the top line of wheat, Bottom third horizontal, middle horizontal, different focal lengths, one where the trees were the middle flavor of a Neapolitan landscape, some where they were a thin ribbon. Looked them all over while eating lunch and decided they were all rubbish. There was not texture in the sky, simply a stripe of uninteresting blue. On the way home from lunch they sky was beginning to cloud up, so I went back to the spot. Shot some more but still felt uneasy about what was on the card. As I drove home, I thought I would go to my back up location. I didn't like it as much because of the telephone poles that sat in front of the tree line in the back of the field. As I pulled over and got out of the car, I looked at the clouds in the sky and realized my chance had come, a big wedge of cloud had formed. I walked to the corner of the field and lined up the shot so that the wedge of clouds sat on the Baroque Diagonal of the image and clicked the shutter. I had harvested my wheat..